Sky Ranger was over the scene on Congress and Franklin streets Monday afternoon, where dozens of protesters had gathered to sit in the street. Protesters have blocked an intersection in downtown Boston's Post Office Square. 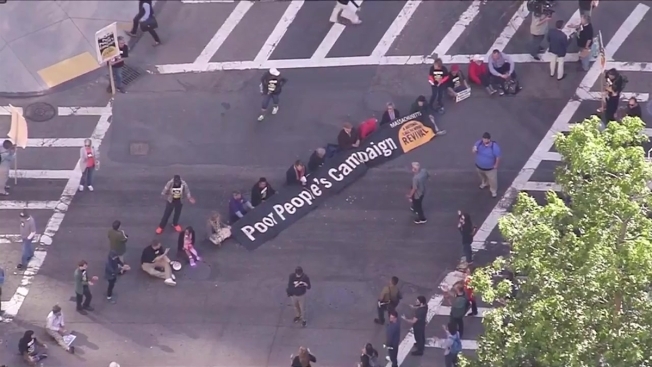 Sky Ranger video from the scene showed the intersection of Franklin and Congress streets being blocked Monday afternoon by a group of protesters sitting in the street holding a banner saying "Poor People's Campaign." The activists were calling for a higher minimum wage. It's unclear if there have been any arrests. The protest annoyed some drivers, but others said they supported the cause. Click here for our traffic map.